Another soul-destroying event beckoned – paediatrician Hayden Luschcombe was exhausted from his relentless shift but knew his wife would expect him to be there on time. Well, THAT wasn’t going to happen. The look on Bernadette’s face when he finally arrived was not a surprise to Hayden – rather it was the norm. But it was the shocking discovery after another shattering day that spurred Hayden into action. His life wasn’t his own anymore; there was nothing in Adelaide to keep him there and the home he’d known all his life in the little Victorian town of Walhalla felt like a sanctuary. A little girl began hanging around Hayden’s cottage – it turned out that she was deaf and the daughter of Isabelle Sampi, another memory from Hayden’s past. But Genevieve was a clever, gifted child and adorable as well – Hayden became friendly with both Genevieve and her mother, who was starting up her own bakery. Her bread and other treats were divine; she was popular with the townsfolk. But there was danger looming. What would be the outcome for the town; for both Isabelle and Hayden who both had secrets in their pasts? 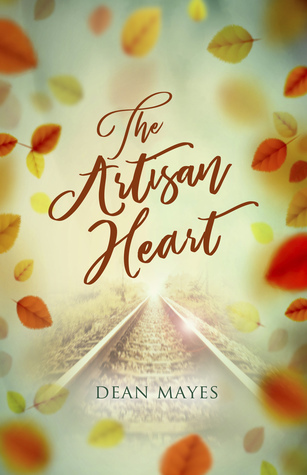 The Artisan Heart by Aussie author Dean Mayes is a gentle and tenuous romance, threaded with suspense, tension and a tumultuous past. I thoroughly enjoyed this novel and loved the character of Genevieve; her stubborn and determined interactions by signing with those around her and her devotion and love of her mother. Romantic suspense at its best! A highly recommended 5 star read. With thanks to NetGalley and the publisher for my digital ARC to read in exchange for my honest review. This entry was posted in Book supplied by publisher or author for review, Contemporary Fiction, Post Script: Book Reviews and tagged #Aussie Author. Bookmark the permalink. Thanks 🙂 It certainly was worth the read! I’ve read this Carol and I really enjoyed it. Hayden’s character felt very different for a romantic hero. The suspense line including that character’s POV added to it for me also.